The best of two worlds in one incredible package! The Abu Garcia Revo Premier Spinning Reel makes liberal use of Abu Garcia’s revolutionary NanoShield technology to create a protective exoskeleton that’s up to 300% stronger than graphite and up to 50% lighter than aluminum! The Revo Premier Reel’s NanoShield also makes key parts of the reel perform better than standard elements. 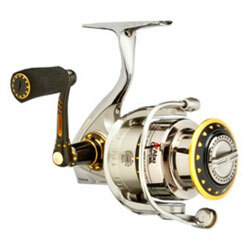 "I have just about as many different reels as a man should have. I feel owning a charter fishing company helps me find out if this reel is worth the purchase price...I am very pleased to inform you that the revo is very good and my clients like fishing with them as well." "I really like this reel. It is by far the best reel I've owned. I have it paired with a Veritas rod that is perfect for this reel. The best thing about this reel is that it casts unbelievably far. " "i have a Stella and i prefer to fish with this one. casting is real smooth and the finish is quality. i have huge confidence in this reel. i pair it with an NRX and it is an great combination all my friends want it." "This is the best spinning reel I own and I have too many!"